We are waist deep in summer here in northeastern Pennsylvania. Although the fishing has slowed down here due to rainfall levels that are way below normal, there is no lack of talk about how the Marcelus gas exploration will affect our environment. We're all sitting on pins and needles as the first wells are being drilled nearby and will soon be fracked. We hope you're all having a great summer and getting in lots of good fishing. Well, we're stuck in the Atlanta airport for 8 hours. Isn't much fun. The last two days at Isla Holbox were something else. The ocean was like liquid glass on Friday and tarpon were rolling everywhere. 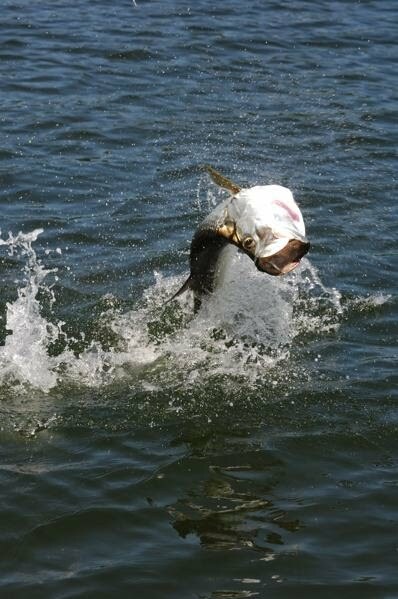 Everyone who went out (some went to the lagoons for baby tarpon) had shots at big tarpon in perfect conditions. It was incredible to see. The day was truly a gift after a tough start to the week. Saturday was not as calm a day but nearly perfect again, a little ripple on the water which probably helped the fishing. We watched Ted Reznik jump two big fish. I didn't boat any, but it sure made us want to go back! Next year seems so far away now. Luciano, we miss you already! http://www.facebook.com/BeckPhotographyJust wanted to let everyone know that we posted a few photos from Isla Holbox, Mexico. We're having a beautiful week of weather. The big tarpon are being shy, but we're having fun with the baby tarpon. Maybe tomorrow will be our day with the big boys! We handle fish almost daily as either instructor, trip host, or fishing photographer. In all of these situations we want to capture the image and at the same time be sure that we are releasing a healthy fish that is not stressed or exhausted. Insuring the survival of the fish always takes priority over the photograph and there have been many times when we quickly released the fish without the photograph. Sometimes we have to consider our own safety. Toothy fish like barracuda and sharks come to mind and even a small Jack Crevalle can give a nasty wound if handled improperly. Heck, we can get a sore hand by getting poked with the dorsal fin of a harmless panfish! These potentially hazardous situations can result from getting our hands too close to a mouthful of teeth (as in barracuda), or coming in contact with a sharp spine or gill plate (jack or snook), or an actual intended bite (shark). Cathy once grabbed a decaying sockeye salmon for a photo in Alaska and got her fingers inside its mouth of teeth. It took a month of antibiotics to get rid of the infection caused by bacteria in the rotting process. Be careful where you put your hands. Consider using a boca grip on a big fish to safely handle it for a photograph. This is the system we use when we photograph fish. The longer a fish is out of the water the better the odds are of it not surviving. If the fish is in good shape one of us will compose the photo while the other is holding the fish safely underwater either gently cradling it or using a net. The person in charge of the fish can be getting it into the correct position for the photograph before lifting it when the photographer gives the word. If the head of the fish is gently cradled in one hand while gripping just ahead of the tail with the other hand, you’ll see plenty of the fish in the photograph and have a comfortable hold on it. For big or especially slippery fish a fishing glove or even a sun glove will help grip the tail. Make sure the glove is wet to protect the fish. 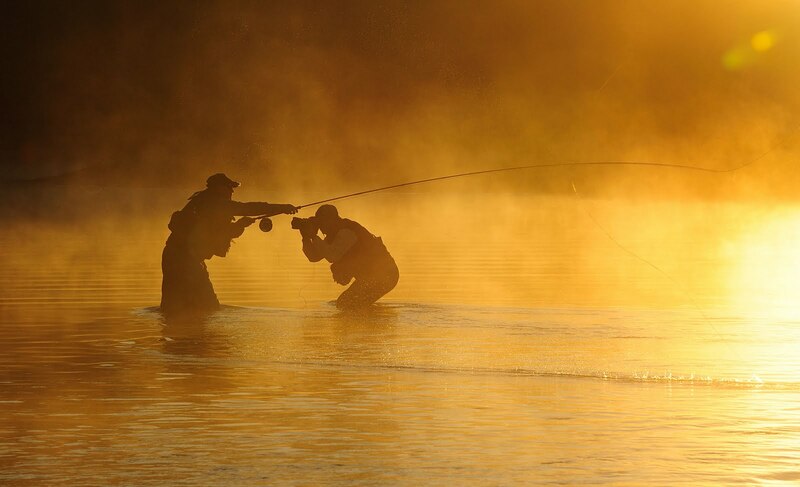 Our first photo will be a test shot of the angler holding the fish in the water. Then we'll check the photo for proper composition, lighting, etc. We may need to do this a couple times. When everything looks good, we'll let the angler know we're ready and on a count of three, the fish is lifted out of the water, the angler smiles, and the photographer fires three quick shots and the fish goes back underwater. We may repeat this process a couple times but with each “lift” the fish is only out of the water for about 5 seconds. while he gets his camera out of his pocket, turns it on, checks the program, and finally gets around to trying to hold the fish with one hand and photograph with the other. The only thing worse might be having the fish fall our of your hands in the boat or it landing in the dirt and stones alongside the water from an angler in a standing position. We always try to keep the net close by and the fish close to the water. If he slips away from us unharmed, so be it. If the images look good in the preview, it’s time to release the fish. We’re still holding the fish with a firm grip just ahead of the tail keeping it in an upright position in the water. If it’s not anxious to go we slowly move it in a figure-eight or circular motion facing into the current making the gills work. Make sure the fish is in clean water where turtle grass, moss, sand, or mud won't foul the gills. If it's a trout, the water should be cold as well as clean. In saltwater, if the fish is exhausted or bleeding there may be predator fish in the area waiting for a chance to get at him. If it starts to turn sideways or goes upside down it’s in trouble, rescue it and repeat the revival process. 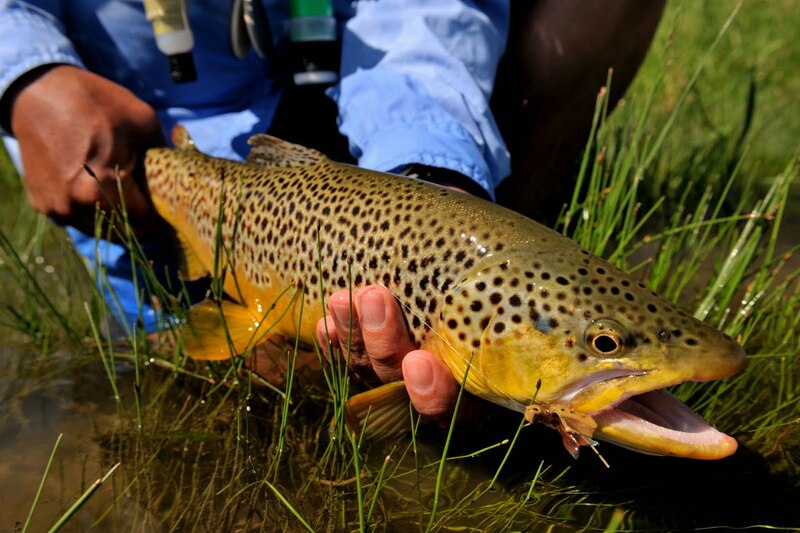 Remember, making sure the fish is healthy and not in any danger is the most important factor. Tail: Tan, Black or Olive Blood Feather overlay 6 strands Krystal Flash in corresponding color. 800-443-8119 or Tan, black or olive. Legs: Two rubber sili-legs. Root beer, black or olive. Eyes: Lead eyes painted yellow and black. XS on size 8, small on size 6. Head: Spiked dubbing figure-eighted around the eyes. Or, dubbing brushes if available. The idea for Cathy’s Super Bugger was to design a fly that would create more underwater vibration or noise which would help fish locate and find the fly. The combination of a thick web hackle body and sili-legs pushes the water as the fly is retrieved, creating noise and vibration. Having the eyes tied ontop of the hook inverts the fly as it is being retrieved, gives it a more leech-like action in the water, and keeps it from fouling on the bottom. 1.Secure the painted eyes at the thorax positon of the hook by figure eighting with your tying thread. This is approximately a quarter of the hook shank back from the eye. Coat the thread windings with super glue and let dry. 2.Take the tying thread back to the rear of the hook shank. 3.Tie in the 6 strands of Krystal Flash. It should be the length of the hook shank. 4.Tie in the marabou tail, same length. 5.Tie in the first of the grizzly hen body feathers. Wind the hackle forward toward the hook eye, but keep it tight. The idea here is to build bulk with hackle. Once you've finished, tie in the next hackle in the same manner. It may take four hackles to complete the hackle body. 6.Tie in the two silli legs by figure eighting them with thread around the hook eye. They should be sticking out from the sides and the length of the leg should be the same on each side. 7.Figure eight the eye with a spiked dubbing to create a head. 8.Whip finish and the fly is done. Marabou shorts (or blood feathers) work best and in the end are more efficient than buying a plume. Coat your painted lead eyes with Sally Hansen's Hard As Nails. They will hold up better. (In the cosmetic section of your pharmacy). Remember to open up your casting loop with any lead-eye flies. This used to be called chuck and duck fishing. Also, with a tight loop the fly could potentially hit the rod blank and break it. If you're a Sage customer, this means your Z-Axis is going to be better than your TCX. Vary your retrieve speeds and remember to set the hook with your line hand and not the rod tip. 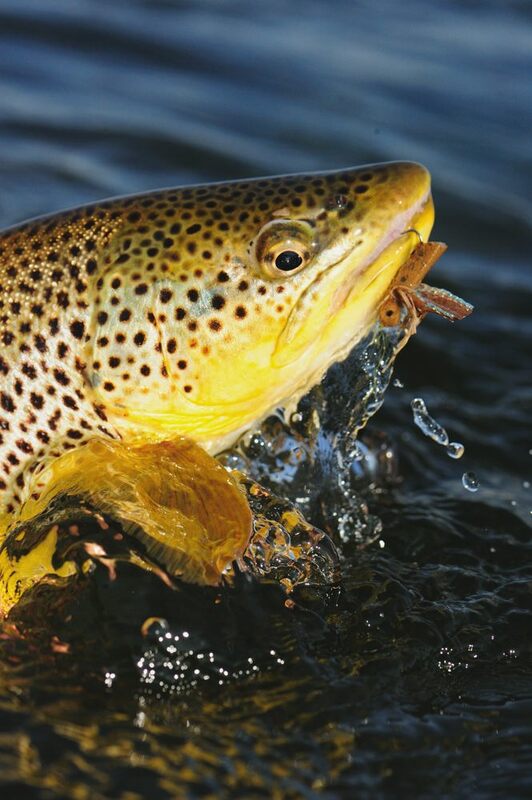 If you miss the fish the fly will still be in the game and the fish may take again. Black works best in off-color water. 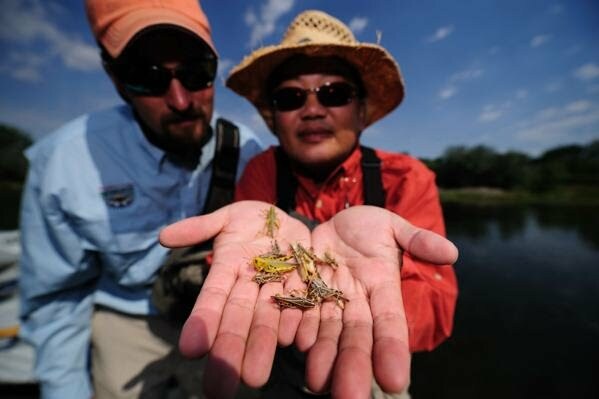 Tan is the perfect color for any stream or river that has a crayfish population. We have a few openings on upcoming trips that we want to tell you about. 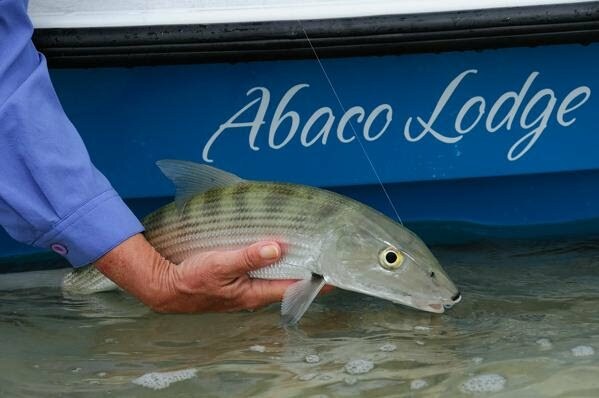 We have a couple spots at Abaco Bonefish Lodge (May 14-21), one opening in Holbox, Mexico (June 13-19), and a couple on the Bighorn (August 14-21 or 21-28). We have space available for 4 night/3 day and-or 7 night/6 day packages. Click the links for prices and details on our Hosted Trips page. Abaco Bonefish Lodge, Bahamas. Come along with us as we search the hard white sand flats so typical of the Bahamas for bonefish at this strategically located new lodge during prime time. For a short time each year the big migratory tarpon are found at Holbox Island. The baby tarpon are always in the rivers and lagoons. Join us for an exciting trip fishing for both the big boys and the acrobatic babies. If you saw the Wall Street Journal recently, you may have read about the expected grasshopper infestation in the west this summer. It's predicted that there may be 7 times the usual number of grasshoppers - the most in 150 years! The Bighorn is an amazing river during normal years, if this event happens, believe us - you don't want to miss it! Join us at Kingfisher Lodge in August. Hey, here are some pics from our weekend in Indianapolis. 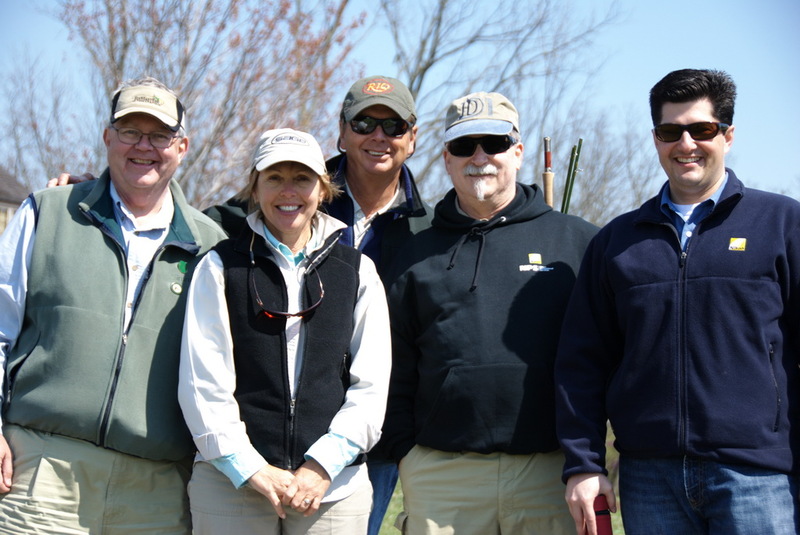 Thanks again to our sponsors - Jody Grober at Roberts Distributors, Greg Napoli at Nikon, and Jon Widbloom at Flymasters. 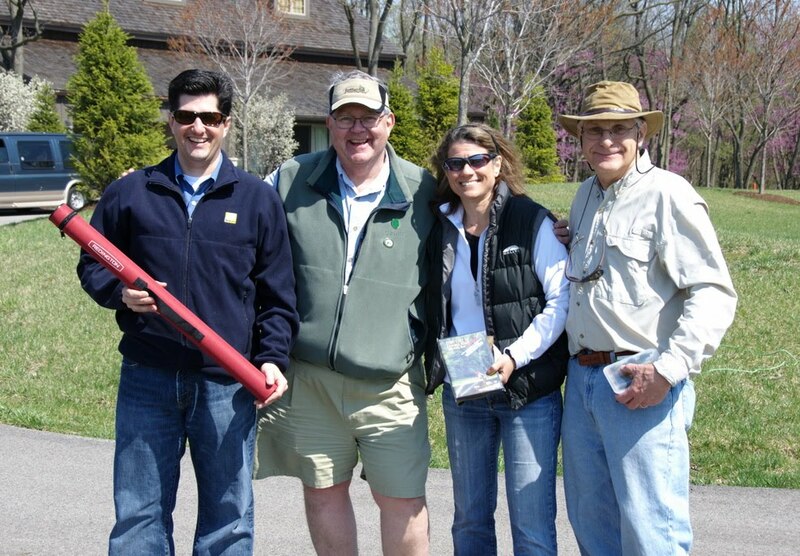 The winners in the fly casting accuracy contest are Greg Napoli, Patti Beagle & Jon Williams with Jon. We had a great time and met lots of terrific people. Thanks everyone for coming out. 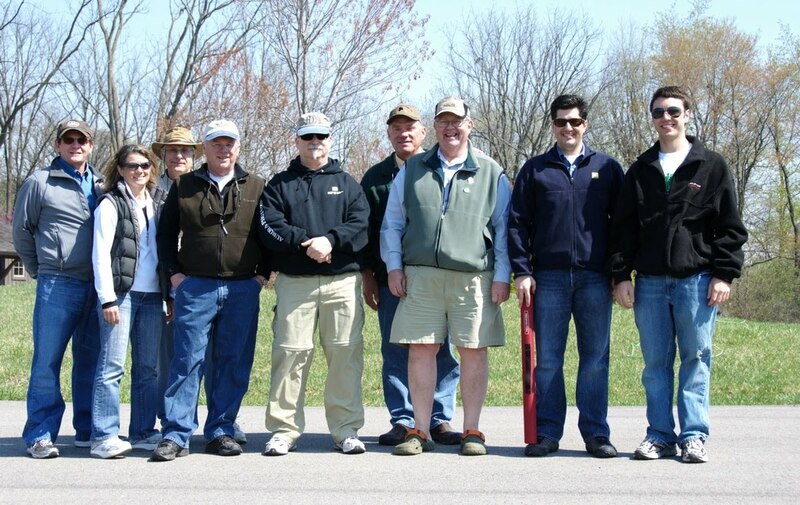 Greg Napoli, Central Manager, Photo Sales Division, Nikon, just sent me this video clip of Jody Grober at Roberts Distributors, Indianapolis, at the fly casting contest on Saturday. Greg shot this with a little Nikon point-and-shoot camera. The orange is the yarn landing inside the target. It's a pretty neat take from the target's perspective.